Here are3 books on Transfer Factor that have been written in recent years, each of which can be downloaded in a PDF. The first 2 books give a quick review of the immune system, demonstrate the need for powerful immune system education and support, and present Transfer Factor as the best possible solution for these challenging times. Both authors tell how "Transfer Factor" was discovered at New York University in 1949, and summarize its long history of research, safe clinical usage, and effectiveness in a variety of health conditions - documented by appropriate references. 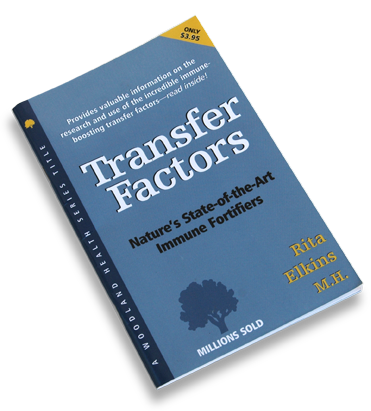 Transfer Factor, Nature's State-of-the-Art Immune Fortifiers was written in 2001 by well-known Master Herbalist, Rita Elkins. She authored over 40 natural health books as well as numerous magazine and other articles, lecturing widely and hosting health talk shows. Her 43 pg. booklet explains the need for immune support & how "TF" meets that need. Her simplified approach with accompanying charts make the booklet both patient and Physician reader-friendly. 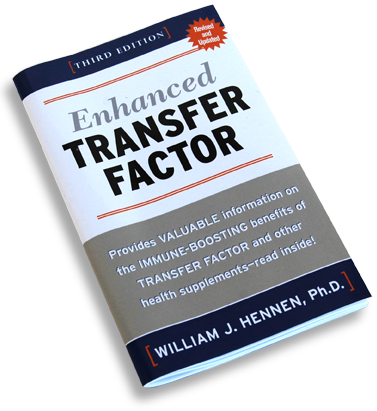 The 2005 third edition of Enhanced TRANSFER FACTOR, was written by Dr William Hennen, PhD in bio-organic chemistry. Dr Hennen was the first scientist who went into the medical libraries in the late 1900's to read the more than 3000 medical papers written on transfer factor here and abroad. He includes in his book some of the more recent research done with TF formulations in the 21st century as well as outlines some of the well-researched, non-toxic herbal supplements, vitamins and minerals that complement TF for a more powerful balancing/boosting effect upon the immune system. 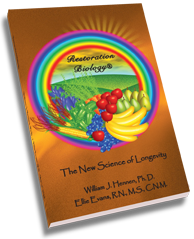 Restoration Biology®The New Science of Longevity, written by Dr. William Hennen (Ph.D) and Ellie Evans (RN, MS, CNM),is a wonderful overview of the of the human body’s amazing ability to continually restore itself from the cell level up. Key concepts are well illustrated, which makes this easy-to-read book even more helpful for understanding the remarkable power we each have to determine our foundational health by the choices we make every day.